The vampire sorcerer Uctebri has at last got his hands on the Shadow Box and can finally begin his dark ritual - a ritual that the Wasp-kinden Emperor believes will grant him immortality - but Uctebri has his own plans both for the Emperor and the Empire. Tisamom the Weaponsmaster is faced with a terrible choice: a path that could lead him to abandon his friends and his daughter, to face degradation and loss, but that might possibly bring him before the Wasp Emperor with a blade in his hand - but is he being driven by Mantis-kinden honor, or manipulated by something more sinister. EXCERPT - The machines of war are turned on your own people. Your friends are loyal to you, and they shall die for it, or be scarred through, and never to recover what they once were. Blood is born of blood, welling up between the trees, beneath the gold lightning. Ancient evils brought to light, the dead tradition of the life-​drinkers remade, and armies marching under a standard of black and gold and running red. A pillaging of the past for power, so that even the worst excesses of the old times are dug up. The worms of the earth! I see the worms of the earth feasting on all our corpses. Autumn leaves, Stenwold Maker. So many that you shall not see again. They fall and fall, the leaves of autumn, red and green and black and gold. The war that was inevitable has finally arrived. And for the first time, the end looks nearer. Collegium is as much prepared as it can possibly be. The bee city of Szar is on the verge of rebellion after the death of their Queen. The Wasp Emperor has ordered Totho's crew to deal with the situation. Tisamom has disappeared. After breaking all ties and bonds with his kinden, Tisamom has walked the road of mindless suicide as long as he is near to the Emperor he wants to assassinate. Achaeos, barely alive after the wound received from Tynissa, travels to Tharn with Che, in order to heal and prevent the horrors of the Shadow Box from escaping. Little do they know, their efforts hold little meaning. At Tharn, Che meets the disgraced Wasp officer, Thalre, who is running from his own empire. Together, Che and Thalre move to Myna to fuel the resistance against the Empire. However, being allies with a renegade Wasp doesn't always guarantee your safety, as Che soon find out. Salma, now leader of a wandering horde of people, is creating Havoc among the Wasp armies as they appear and disappear at will and thwart the well laid plans of the Wasps. Nero and Taki travel back to Solarno, to start the rebellion as time draws to a close. This is it. All the hints, clues and everything that made you question in the first 3 books are answered here. Tchaikovsky ties down all those loose threads in an epic conclusion of the first half of the series. And this series is far from over. If you've attached yourself to a particular character, I will ask you to get over it. Because by the end of the book, you'll need to eventually. Over the course of 3 books, Stenwold's close friends and confidants include Che, Tisamom, Tynissa, Nero, Taki, Achaeos, Salma and a few more. And sadly, only a couple of them survive the epic battle that commences. They have paid with their lives for duty and a sense of honor but even then, their loss has left me with a hollow feeling in my heart. This is by far the best book. The very best. 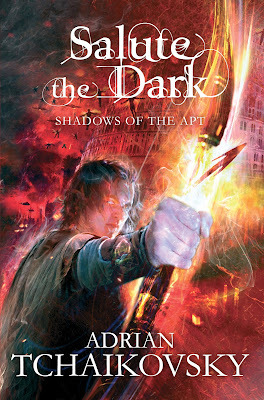 Salute the Dark raises the standard of fantasy a notch higher. Duty, love, ambushes, strategic war planning, bloodlust, dog fights in the air, this book has the best of everything. Everything comes to an end here, but the tale has not yet ended.